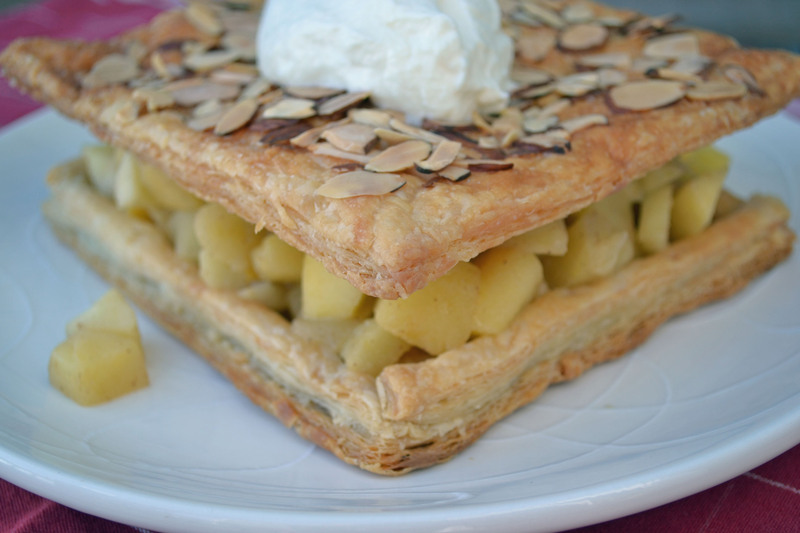 When I found this recipe nestled in the puff pastry and strudel section of “The Art of Fine Baking,” the end result seemed difficult to visualize and definitely wasn’t what I expected from a recipe with the title “Sauteed Apple Cake.” I therefore had to try it. 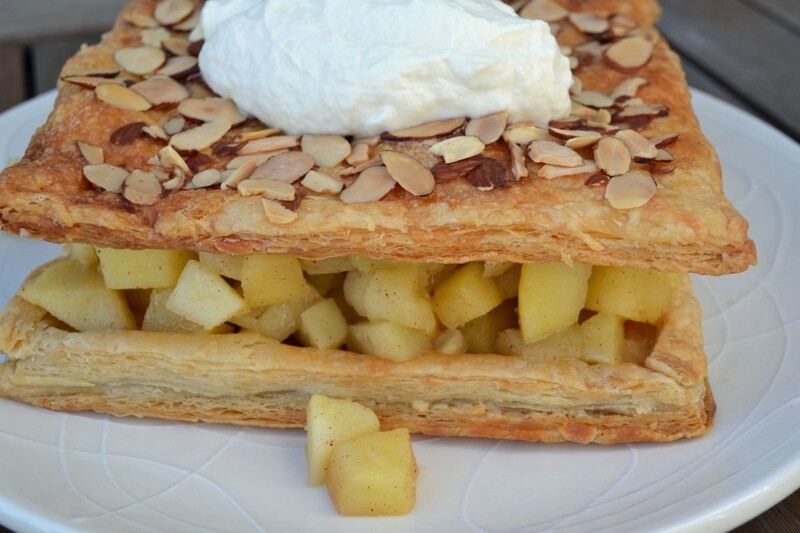 Layers of flaky puff pastry hold buttery sautéed apples and a giant dollop of sweetened whipped cream with a crunch of almond ties it all together. I don’t think I’ve ever seen anything quite like it. As shown in the photos, I chopped the apples in fairly large pieces so that they wouldn’t become too mushy during the saute process. However, I actually think the finished cake benefits from slightly smaller pieces or just slices, because it holds together better. The taste, of course, isn’t affected either way and is reminiscent of apple pie. I made the flaky puff pastry (or “puff paste” as it is referred to in the book) layers from scratch…yes, from scratch. Homemade Puff Pastry is pretty much unheard of today. It’s very time consuming and it also makes you very aware of how much butter you are consuming when eating something as simple as a turnover or palmier. I actually enjoyed the process of repeatedly rolling the dough to create the butter layers. The resulting pastry tastes richer and a little more pure than those made with frozen puff pastry. However, such a lengthy process isn’t for everyone and this recipe can be made easily using the frozen version for this same unique twist on a cake. If using homemade puff pastry, roll out pastry slightly less than 1/8 inch thick. Trim edges. Divide into two 8 inch squares and 4 strips 1/2 inch wide. Place squares on baking sheet. Brush one square with egg white mixture and arrange strips along edges to make a border. Chill both squares. Just before baking, brush plain square with egg white mixture. Sprinkle it with granulated sugar and sliced almonds. Bake 30-40 minutes until golden brown. While pastry bakes, make apple filling: In a large skillet, saute chopped apples with butter over medium heat. Sprinkle apples while they cook with sugar, cinnamon, and lemon zest. Turn occasionally with a spatula to lightly brown apples on all sides. Do not stir or apples will become mushy. When they are tender or lightly browned, remove from heat. Pile apples into baked shell. Fit sugared square on top. Serve warm with whipped cream. To re-warm: place in 300 degree oven for 15 minutes. Never tried this one – but I will. Looks delicious. 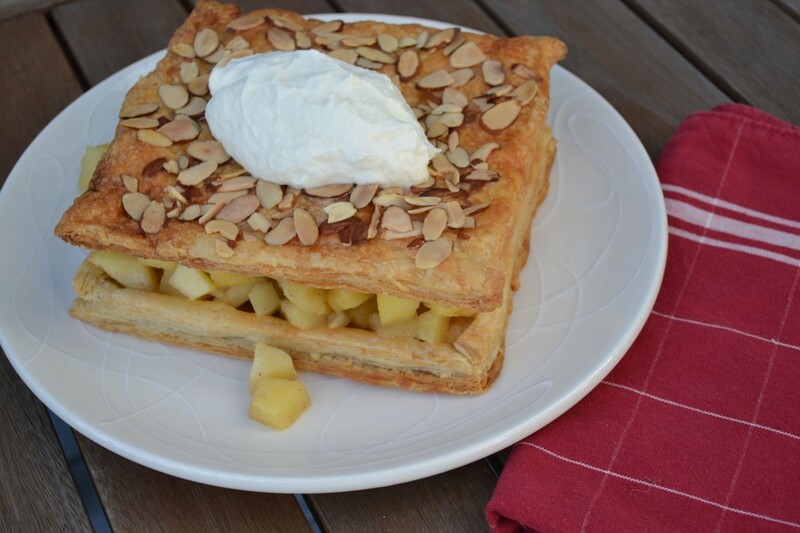 Is there any way to make wheat-free puff pastry? Thanks Elaine. I’ve never tried it myself, but I’ve seen people make puff pastry with gluten and wheat free flours such as Tapioca flour or white rice flour.